What’s the worst time to think about industrial refrigeration maintenance? After your refrigeration system breaks down. Emergency commercial refrigeration repair can be costly in more ways than one. Not only can the repair itself put a dent in your budget, but the loss of product and customers during downtime can be devastating. That’s why it’s important to do regular industrial refrigeration maintenance. While you don’t need to perform full maintenance all the time, there are some essential measures you shouldn’t skip. The condenser coils on your refrigeration and freezer units are vital to extracting heat and keeping items cool. But dust and debris from the air and can potentially clog the coils. Clogged coils cause the refrigerant flowing through the unit to get too hot and can damage other components. It can make the evaporator work harder and take longer to cool. This can shorten the life of the unit, cause a malfunction and increase energy consumption. Coils should be thoroughly cleaned at least every six months to maintain ROI and extend the lifespan of your equipment. Door gaskets are the most common industrial refrigeration component needing replacement. Gaskets create a tight seal when the door of your unit is closed, but they crack and wear over time, which lets your refrigerator’s cool air seep out and let warm air in. This can cause the unit not to hold temperature, compromising the product inside, which could lead to safety issues. This also forces the compressor and condenser to work harder, which impacts their lifespan and your energy bill. Damaged or worn gaskets hinder your unit from holding the correct temperature, reduce its efficiency, and shorten the life of the unit. Regularly checking and, if necessary, replacing these components extends the lifespan of your commercial refrigeration unit and makes it more energy efficient. The fan keeps the refrigerator cool and prevents frost from forming. But the fan and motor can collect dust and dirt that can cause jams or hinder the fan from spinning freely. This causes the system to work harder and can lead to poor efficiency or malfunction. Keeping these components clean is essential. Clogs in the drainage hose can prevent proper defrosting of your commercial refrigeration unit by damaging the motor. It can also cause water leakage. It’s important to have the drainage hose regularly checked to avoid these issues from affecting the unit’s performance. If drainage becomes a larger issue, such as water backing up over the coil, it may require a shutdown of the entire unit to clean out the clog. You may not think simple cleaning your commercial refrigeration unit as essential maintenance, but it is. Bacteria can easily form on poorly maintained units, which compromise the safety of your stored items. So regularly clean the units and replace the liner if there is any damage to it. Keeping your refrigerator and freezer units running is crucial to your business. Performing these simple maintenance checks can go a long way in keeping your system running properly and avoiding those costly emergency repairs. The easiest way to keep up with all these maintenance items is with a service contract with one of the 5-Star Seal of Approval contractors. A service contract will ensure you the best service and maintenance in a timely manner. Need a commercial refrigeration specialist to inspect your units? Find a contractor near you. 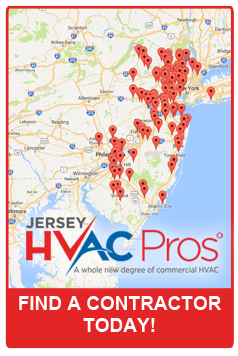 Jersey HVAC Pros Copyright © 2018. All rights Reserved.